Security Blankets, created by Indianapolis artist Philip Campbell, presents a series of uniquely designed quilts that incorporate 21st Century materials that help to protect from the current social climate. His quilts are beautiful to look at and soft to the touch. The quilt, What’s Your Password?, incorporates military-grade fabric that blocks out all radio frequencies, WIFI and cell-phone signals, to demonstrate insulating ourselves against societal fears like identity theft. 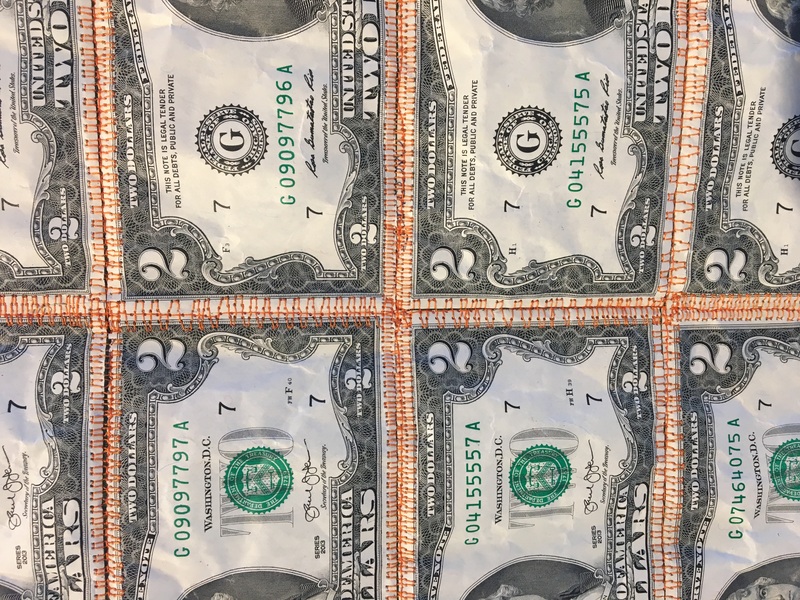 The quilt entitled $2 integrates spendable paper currency into its design speaking to society’s financial instability. About the Artist: Campbell’s experiences have inspired him “to make art that people can touch and interact with.” His work has been exhibited at the Indianapolis Museum of Contemporary Art, the Harrison Center, and at the Adventureland Gallery in Chicago.